St. 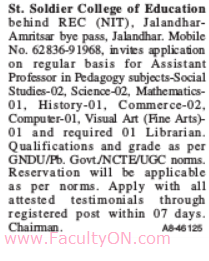 Soldier College of Education, Jalandhar has advertised in THE TRIBUNE newspaper for recruitment of Assistant Professors jobs vacancies. Interested and eligible job aspirants are requested to apply within 07 days from 09th October 2018. Check out further more details below. About College: The St. Soldier College of Education , having made strides in the Real Estate Realm, decided to enter the field of education in 1958, not with any commercial motive, but with the spirit to serve society by taking education to the door steps of rural and semi-urban people.